A man has invoked the 1689 Bill of Rights to fight a £60 parking fine from Worcester City Council at a tribunal. Robin de Crittenden, 67, of Willenhall, near Wolverhampton, argues the bill protects people from having to pay fines until convicted by a court. He said the challenge aimed "to put the politicians back in their kennels". The National Parking Adjudication Service reserved judgment on the case but is expected to notify the parties of an outcome later this month. The Bill of Rights dates from the reign of William and Mary, after James II was deposed in the Glorious Revolution. In part, it reads: "All grants and promises of fines and forfeitures of particular persons before conviction are illegal and void." Mr de Crittenden, a retired business consultant, told the hearing at Worcester's Fownes Hotel that politicians and local authorities were trying to nullify the bill's potential impact on parking fines by calling them "penalty charge notices". He said: "This country is drifting ever closer to a police state. "The public are faced with a vast money-making machine that is a disgrace to each of the local authorities. "The Declaration of Rights provides I have an inalienable right to require that all and any legal actions undertaken against me be heard and resolved by a court of law." 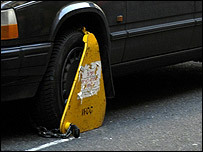 A spokeswoman for the National Parking Adjudication Service said no previous challenge to parking fines using the Bill of Rights had been successful. "There have been a number of cases where the Bill of Rights has been argued to refute liability for a penalty charge notice," she said. "None have succeeded and, as far as National Parking Adjudication Service are aware, there have been no applications to the High Court for Judicial Review of those decisions."